As a recent MBA graduate The Taxbar was a vision of Luis’s final thesis project in graduate school. The vision became a reality and T H E T A X B A R was founded by Luis-Alberto in December of 2015. T H E T A X B A R is located in the Historic District of Downtown Point Richmond. In 2016 our primary focus will be on income tax preparation services for individuals and small businesses. We will also offer bookkeeping and payroll services to a limited number of business clients. We pride ourselves in providing exceptional customer service and expert tax advice at affordable prices. Our environment is different than what you would expect to find in a typical cubicle filled tax office. 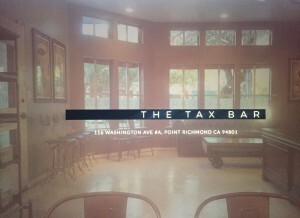 It is our ambition to make you feel comfortable and welcome you to the growing Taxbar family. As The Taxbar grows in the future every location will have a decor unique to each individual location however our exemplary level of service and tax expertise will remain.